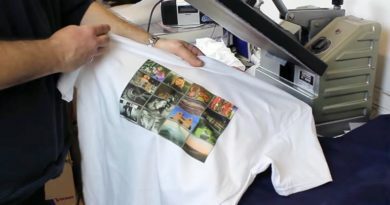 Have you ever thought about creating your own t-shirts, bags, caps or towels, by implementing your image or design on it manually? 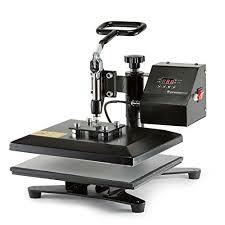 If so, did you also wonder which heat press machine will suit most your inexperienced hands? 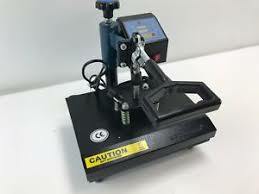 Well if it is the case, this review will shed some light on this subject: Best heat press machine for beginners. 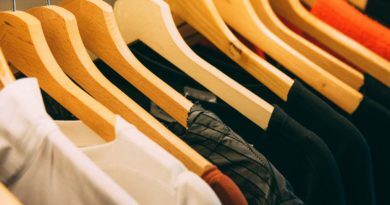 But before we start, if you still have some ambiguity about heat press machines, here is an article that will explain it clearly. Or, if you don’t know how to use it, here is another one that will highlight the steps required to follow in order to imprint a designated design on an object. Let us start our review then! It’s a fact that everyone knows how to use an iron, right? I’m taking this detour simply to highlight the fact that the Cricut easy press is a cross between an iron and a heat press machine, but that doesn’t mean you should use it as an iron though. 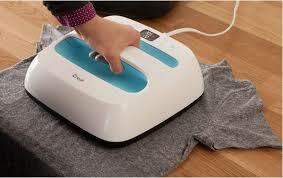 It’s still a heat press but used similarly as an iron. To operate it, you need to power it, select your time, your temperature, that can reach the 350 degrees f(180 degrees Celcius) then pressure your garment for the desired amount of time. It has also other great features like the automatic shut down after 10 min of no use, its digital screen, and most importantly its small size ( not larger than a regular iron), so it is portable. However, due to its small size, this machine isn’t very practical to use on big sized fabrics. The biggest model available is only 12×10 inches. Also, it doesn’t provide a high set of temperature’s range, although its temperature range can cover a high variety of tissues. Keep in mind that this machine is mostly made for beginners and for tiny objects. You have guessed it, if you are looking for a simple, effortless and durable machine, then the Fancierstuido power heat press may be perfect for you, and especially with its clamshell design which will allow you to put your fabrics between two platen, with a fixed lower platen and movable Teflon coated upper one (The Teflon coat is very practical because it will protect your fabrics without the need to buy Teflon sheets), you can’t ask for a more instinctive usage. As for the temperature, which will affect only the upper platen, it can be chosen in an interval that varies from 32 degrees Fahrenheit to a maximum of 699 degrees Fahrenheit controlled with a precise electronic monitor that includes also a timer. The high raise of temperature can be an issue, so as a beginner, it’s imperative that you be extremely vigilant, to prevent yourself from accidentally touching the heated upper platen. As for the heating time, it can take between 10 to 15 minutes, depending on the temperature, but once it has reached its chosen settings, a light indicator will warn you that you may start your imprinting operation. If you feel that the previous machine isn’t made for you, maybe this one will seduce you then. Although this one comes in a clamshell design too, so it will work similarly as the FancierStudio power press heat machine, it has other noticeable advantages, such as the ergonomic foam-grip that Minimizes handle flex when opening and closing the machine (unlike some single-arm machines that tend to twist and torque), and the adjustable multi-spring balancer which allows pressure to be more evenly distributed across the entire 15*15 inches platen when the clamshell is closed. It is also fully programmable with an electronic monitor embedded to it, that controls the temperature which can range between 32 degrees Fahrenheit and 480 degrees Fahrenheit ( 249 degrees Celcius), and controls also the time of the heating process. 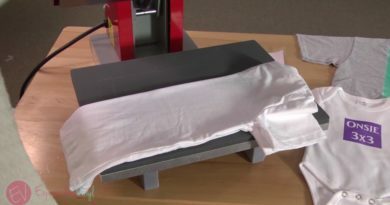 So, if you are a beginner who is looking for a simple home use heat press machine, durable, fully assembled and ready to use, the promo heat may be the perfect match for you, but as I’ve warned you before, it comes in a clamshell design, so be careful when manipulating it when it’s heated. 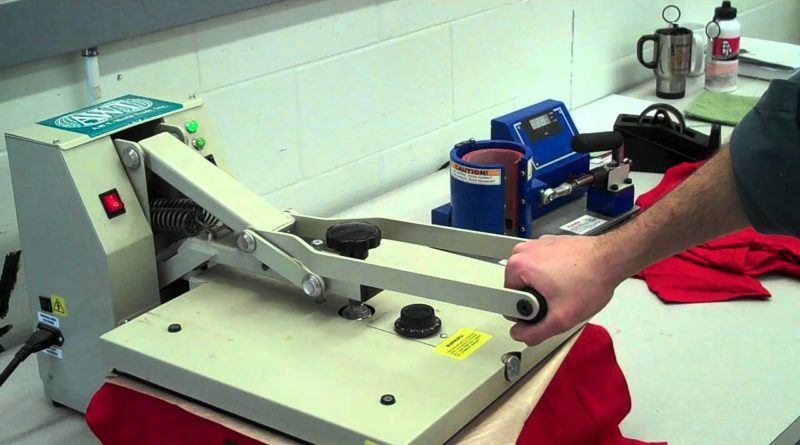 Feeling uncomfortable about using a clamshell heat press machine, and disliking the idea of keeping yourself careful in every move you make when manipulating the heated upper platen? Well, in this case, you might want to consider the ePhotoInc Swing Away heat press machine. As its name suggests, this machine is designed in the swing away architecture which works in this way: The upper plate can rotate within a 360 degrees angle around the bottom one, which will allow you to move your fabrics freely without risking to touch the heated material. But keep in mind that the clamshell design is more instinctive then this one, so before turning the machine on, try rotating the upper platen in different directions to get used to this kind of architecture. I have also to mention that the plates have 9×12 inches dimensions. Besides having a safer design than the clamshell machines, this instrument includes a digital timer that ranges between 0 s and 999 seconds, and a digital temperature gauge ranging from 0 to 500 degrees Fahrenheit. The manual open and close handle is easy to operate and can be adjusted with the pressure knob at the rear of the machine. If you are looking for the best heat press machine for home use on different fabrics such as t-shirts, bags, mouse mats, ceramic tiles, plates, and other flat surfaced items with a safer touch, then I recommend first to check your budget. 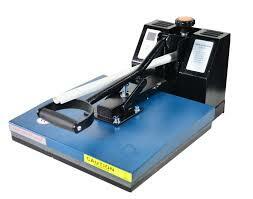 The best heat press machine for beginners with a tight budget would be in my opinion the ePhotonic Swing Away 9*12. If you are looking for something easy to transport and to store, the Cricut heat press is definitely the choice for you. Finally, If you want an entry level machine with a big plate and a correct range of temperature, I will recommend picking the FancierStudio 15*15 . Now that you have an idea about some of the best heat presses suited for beginners, you may start your adventure, whether it is for profit or for a hobby. If you still have some fuzzy points, don’t hesitate to drop a comment below!